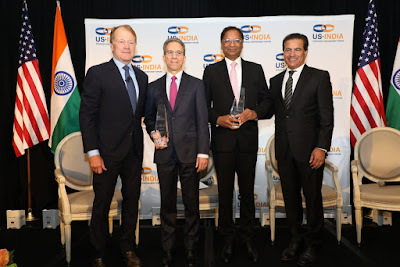 The U.S.-India Strategic Partnership Forum (USISPF), in its first ever Annual Leadership Summit, awarded Ajay Singh, Chairman & Managing Director, SpiceJet, with the USISPF Leadership Award, an honour established by the Forum to commend excellence in transformative leadership and public service, along with the leaders’ role in expanding trade and collaboration between the U.S. and India, on July 12 in Washington, D.C.
D. Jim Umpleby III, CEO of Caterpillar Inc., was also conferred with the Leadership Award. Both the business leaders were felicitated for their transformative role in developing U.S.-India business ties and progressing the lives of citizens in the U.S. and India. The Annual Leadership Summit hosted in Washington D.C., highlighted the Forum’s commitment to furthering the strategic partnership between the U.S. and India. The theme of this year’s summit was “Strengthening the Strategic Partnership”. “I am deeply honoured to receive this prestigious award. SpiceJet is privileged to be a part of USISPF’s journey and vision. This recognition belongs to every SpiceJetter who has worked relentlessly to resurrecting a dying company and building a globally admired airline in less than three years. SpiceJet’s success is a testament to the strong and growing relationship between India and the US. This is just the beginning and we look forward to making great strides together in the years to come.” said Ajay Singh, CMD, SpiceJet. Under the leadership of Singh, SpiceJet placed an order for up to 205 narrow and wide bodied aircraft – one of the largest orders for new airplanes in Boeing’s history. SpiceJet was lauded by US President Donald J. Trump for this aircraft order and helping create tens of thousands of jobs in the United States. SpiceJet followed up the Boeing order with an order for 50 Bombardier Q400 planes --- the single biggest order for the Q400 in Bombardier’s history. The event brought together key stakeholders, including Government of India officials, industry leaders from the U.S. and India, and government officials in the United States to discuss opportunities in investment. Approximately 300 senior level business leaders and investors attended the Summit. Attending companies at the summit included Walmart, Dow, Boeing International, Abbot, Amway and Bank of America. Industry and government leaders from the U.S. and India discussed the value of the U.S.-India partnership between the two countries and how their shared values of democracy, security, and sustainability are being applied in both business and government to spur job creation, encourage innovation, and accelerate economic growth. Some of the key speakers from India who attended the summit were Navtej Sarna, Ambassador of India to the United States and Rajiv Kumar, Vice-Chairman of Niti Aayog. Representative from the USA included Senator Rob Portman (R-OH); USDA Under Secretary for Trade and Foreign Agricultural Affairs, Ted McKinney; Jeffrey Gerrish, Deputy U.S. Trade Representative; and Senator Mark Warner (D-VA), Co-Chair of the Senate India Caucus among others. Among the major highlights of this year’s Summit was former Secretary of State, Henry Kissinger, participating in a fireside chat with USISPF’s Chairman, John Chambers, former Executive Chairman & CEO of Cisco and Founder of JC2 Ventures. The summit followed a year where India has seen unprecedented global economic growth. As the fastest growing economy and soon to be third largest consumer economy, India is of vital interest to the U.S. with regard to trade, technology and innovation. Led by the most prominent leaders in U.S.-India relations, USISPF has already been instrumental in furthering this partnership during the organization’s first year of existence.